The RC coupling is the easy and most commonly used method of cascading of wideband amplifier or audio amplifier stages. 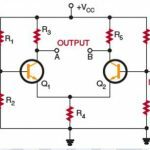 The AC voltage signal developed across the collector load of each stage is coupled through the capacitor to the base of the next stage. The amplifier using the resistance capacitance (RC) coupling method are called as RC amplifiers. Above figure shows a circuit of two stageage commoitter amplifiers. The resistor R1, R2, RE and capacitor CE form biasing and stablization network. The emitter bypass capacitor CE connected at the emitters of transistor Q­1 and offer low reactance path to input AC signal. The voltage gain of each stage will be lost without this capacitor. The resistor RC and the coupling capacitor CC form the coupling network. The coupling capacitor CC is used to couple the output of first stage to the base of the second stage. The purpose of the coupling capacitor is to appear as an open circuit to DC voltage but as short circuit to AC voltage. As a result of this, there is no DC interaction between stages i.e. the DC voltage of the first stage does not disturb the operating point of the second stage.